We love incorporating all natural products into our lifestyle! We use to use a stainless steel polish from the store but it smelled really unpleasant and I really didn’t want my kids breathing it in, plus it was really pricey. A polish really is necessary though to keep your stainless steel fingerprint free and shiny. I grew up polishing my wood with olive oil so I though it would work just as well on our stainless steel appliances. 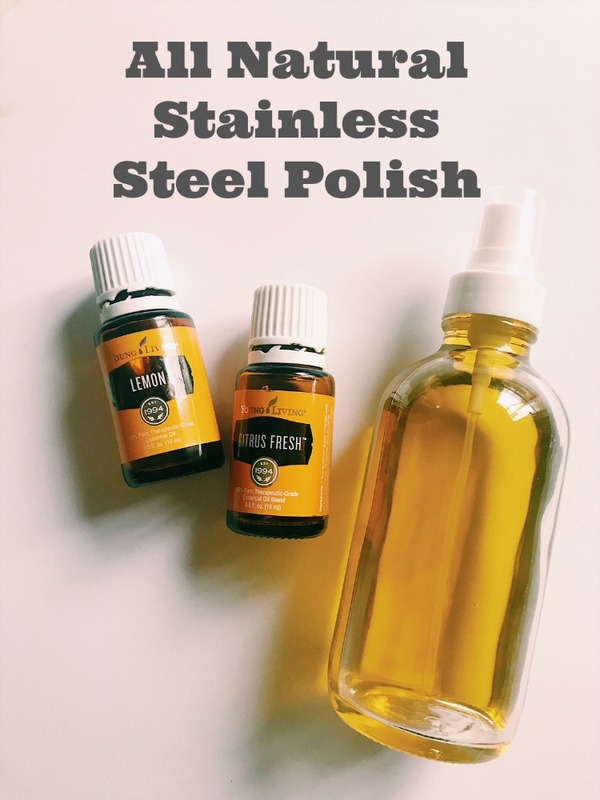 I created this easy to make homemade stainless steel cleaner polish recipe and I am so happy with the shiny smudge free results! This is a very easy homemade cleaner recipe to put together! First start with your glass bottle and olive oil. Glass is better than plastic because it doesn’t react with essential oils. You can use an old empty bottle or order on amazon (affiliate link). Add 8 oz of olive oil into your bottle. Next add 5 drops of your Young Living Lemon Essential Oil and 5 drops of your Young Living Citrus Fresh Essential Oil. 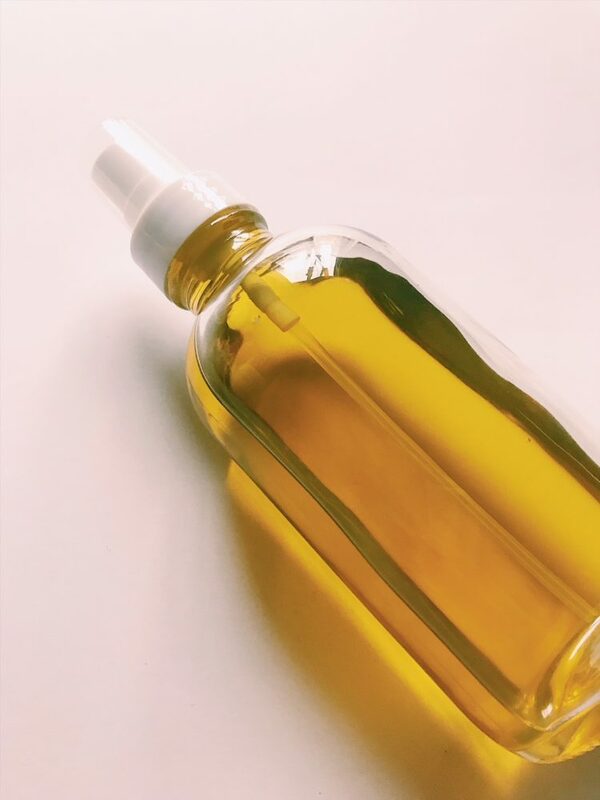 Adding these 2 citrus oils make your polish smell fabulous but they also have antibacterial, antiviral and astringent properties making them perfect essential oils to add to this polish and keep your appliances germ free. Once all the ingredients are added, give your homemade stainless steal cleaner polish a good shake and spray away. Then just wipe away streaks, smudges, and fingerprints! Having your homemade stainless steel cleaner polish in a spray bottle just adds convenience when using your polish. After spraying on your polish, use a dry cloth (I usually grab an old t-shirt from one of my kiddos’ drawers!) and buff into your stainless steel. The olive oil and essential oils will leave your appliances fresh, shiny and fingerprint free! Try this out next time you do a deep clean! 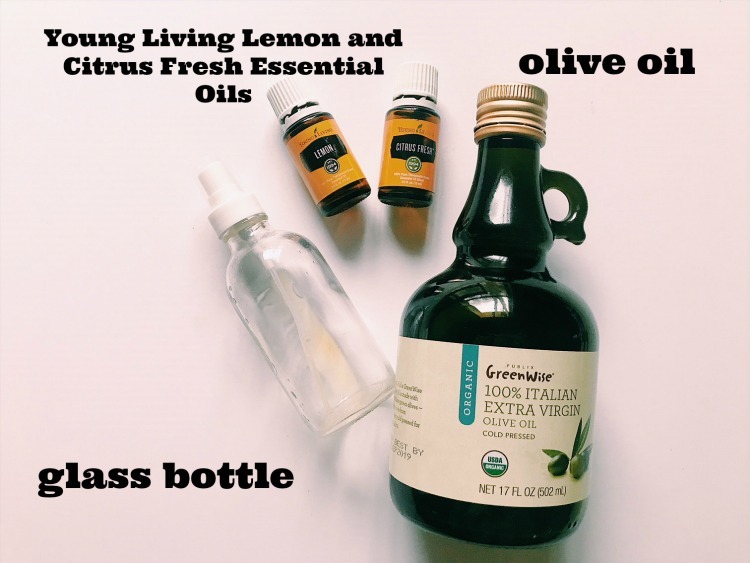 Have you ever made your own polishes or homemade cleaners using your essential oils? Give this polish a try the next time you want to polish your stainless steel appliances! You’re going to love the results! *I am a distributor for Young Living. If you wish to order essential oils, you can click here.